Longsheng is a multi-ethnic autonomous country in northwest Guilin, where 10 ethnic minorities cluster, including the Zhuang, Yao, Miao, and Dong, etc. As a highlight destination of Guilin Tour, Longsheng draws most travelers for the spectacular terraced fields, colorful ethnic culture and natural hot spring. Remarkably, the world-renowned Longji (dragon backbone) Rice Terraces looks like the beautiful belts or ribbons waving from the foot to the peak of the mountains. Such a splendid scene will make you linger on and forget to return. 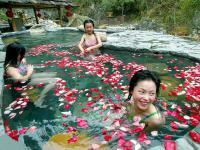 Now, get clear about the attractions in Longsheng and plan a Longsheng Tour with Guilinholiday! 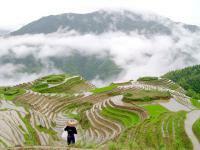 With a history of 600 years, Longji Terraced Fields is one of the 12 top classic scenic spots in Guangxi Province. 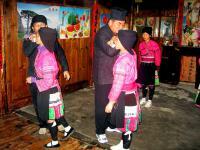 Moreover, the ethnic groups of Zhuang and Yao will also add special charm to this area. 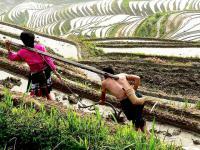 In addition, smaller rice terraces like Jinkeng Rice Terraces are also interesting. 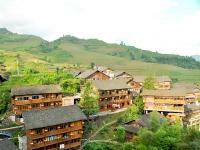 Within Longji Terraced Fields area, Ping’an Zhuang Village is a most popular spot. It is a typical village of Zhuang minority with around 100 households. Here, most villagers make their living by farming. Wander around the village and glimpse into the real life of the locals. 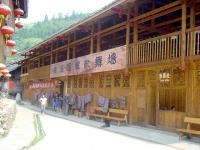 As for Yao ethnic villages, Huangluo Yao Village and Ximen Yao Village is highly recommended. Villagers in Huangluo are hospitable and fond of singing and dancing, while the Red Yao ladies extend their warm welcome to visitors via the long hair performance. Then, the Ximen village is located between Longsheng town and the hot spring resort, where terraced rice paddies twist like dragon in front and streams zigzags behind. After sight-seeing of the Terraced Fields, why not choose Longsheng Hot Springs National Forest Park to spend your leisure time? The park boasts a dense primeval forest, various rare animals and plants, as well as its famous hot springs. 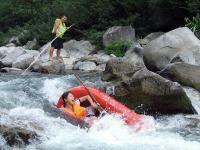 If you want to experience something thrill, the National AAAA Tourist Attraction—Yanmen Gorge Rafting will be ideal, which is a comprehensive tourism course and integrates rafting, leisure, vacation and expedition. The section of rafting is regarded as the good place for funs as it features abundant shoals, rapid river bends, varying river falls.